﻿As a Christian, I try to be a positive role model for my students. I love teaching people of all ages how to ride and care for horses. Safety is a priority for me. I work with students on developing their balance on horses while having fun. I start new students on the lunge line, so they can work on their position without worrying about controlling the horse. I believe that by caring for horses students become hard workers and learn to think of others before themselves. I love watching students create relationships with the horses they ride in lessons. 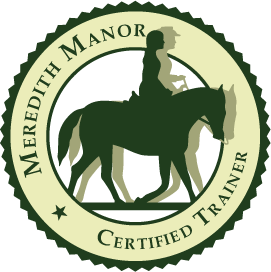 Meredith Manor is an equestrian trade school dedicated to preparing students for careers with horses. While there, I rode in dressage, jumping, and western classes. In addition to riding classes, I also had riding theory classes and showing classes in each discipline. I studied riding instruction and horse training. I also studied massage therapy, horse health, breeding, barn management, and farrier. I spent two years and three months training at Meredith Manor. 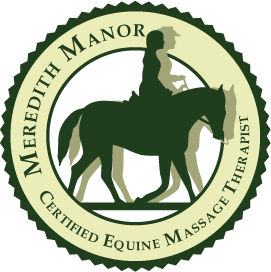 I graduated with my Riding Master VI, Teaching Level I, Training Level I, and Equine Sports Massage Therapy Certifications. After graduation, I got a job teaching beginner lessons and taking care of horses. I grew my client base over the next year and a half. I found the perfect lesson horse, Midnight Candle aka "Mama" in October 2012. I leased "Mama" and used her for lessons. Then in March I bought her; my very first horse, just like I had always wanted. "Mama" is an amazing horse and kids love her. On October 19, 2013, I moved my horses to a private facility and started my own lesson program, Joyful Noise Riding Academy. It was a challenging year with ups and downs. I learned a lot about how to run a business. Being on my own was difficult at first. There had always been a teacher or trainer to ask questions but now it was all up to me! But step, by step I figured it out. Tina, the sweetest quarter horse, joined our team in the summer of 2014. Everyone loves Tina! I couldn't ask for a horse that is more willing to please. She loves to get groomed, hugged, and given treats. September 2016, I married the man of my dreams and became Mrs Durham. Michael is a great husband. Although he doesn't know a lot about horses yet, he's learning. He helps me with repairs and maintenance at the farm. I always wanted a big pretty black horse. I finally got one when we purchased Gus in April 2017. Gus is a 17.3 hand Percheron with a goofy personally. He is very friendly and gets jealous if he is ignored. Gus is always itchy and loves a good scratching.